To read about the impact of Legal Aid’s work click here. Securing Safety for Victims of Domestic Violence– The premier provider of free legal services across Miami-Dade to victims of domestic violence from Homestead to Hialeah to Miami Beach serving thousands of victims of abuse and sexual assault providing advice, representation, and enforcement of restraining orders impacting the lives of innocent victims and countless child victims/witnesses. Providing Stability to Children and Families– The oldest provider of free civil legal services in Miami-Dade representing thousands of clients in increasingly complex divorce, custody and paternity cases directly affecting 1,000’s of innocent minor children and continues to be the only agency holistically representing older teens aging out of foster care providing utmost safety and security to foster youth. Protecting Aging Adults and Other Vulnerable Populations– The largest provider of free legal services to thousands of clients as the only agency offering assistance to those who are willing to serve as guardians for elderly, physically or mentally incapacitated family members/loved ones/aging adults from offices downtown and in South Dade. Guardianship services include representing the growing population of medically fragile teens aging out of the foster care system. Preserving Home Ownership – Protects clients from unlawful evictions, represents individuals in return of security deposit and other landlord tenant cases, defense of foreclosure cases, preserving homes, protecting individuals from collection, and filing bankruptcy proceedings to protect loss of homes. Services include partnerships with DCBA Real Property Committee, Habitat for Humanity to assist first time homeowners with closings and wills, Jewish Health Systems, Hialeah Housing Authority, The Miami VA and Leave a Legacy Housing Program to assist Elderly Homeowners throughout Miami-Dade in need of representation with real estate and tax matters. Advocating for Consumer Rights and Educating on Fiscal Responsibility – Educate thousands of clients and vulnerable populations annually about basic fiscal concepts, such as rudimentary budgeting, credit processes, rights under consumer protection laws, identity theft, predatory lending schemes, taxation, bankruptcy, estate planning and more. 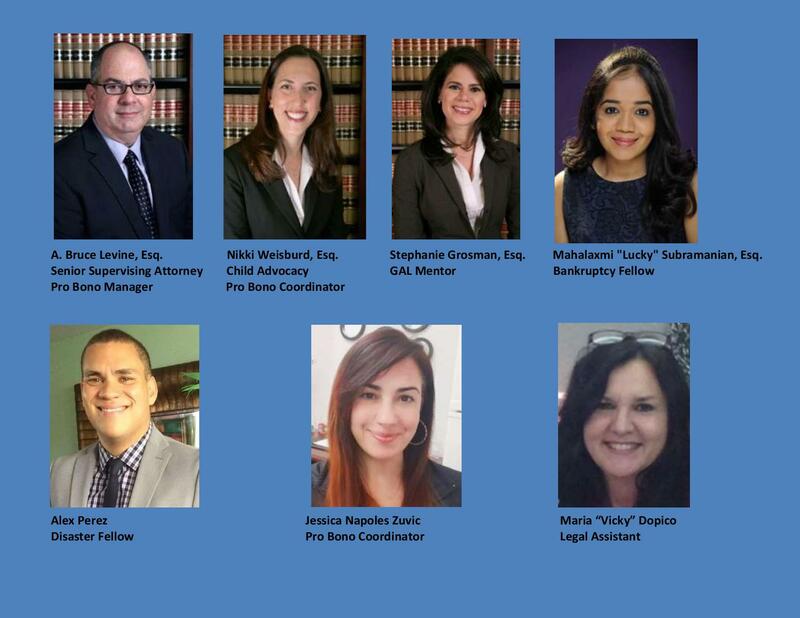 Partnerships with American College of Bankruptcy and American College of Bankruptcy Foundation, Bankruptcy Bar Association of the Southern District of Florida, DCBA, Wilkie D. Ferguson Jr. Bar Association, South Miami Kendall Bar Association and DCBA Young Lawyers Section to coordinate C.A.R.E. clinics, workshops and presentations educating students, parents, staff and social service agencies. Small Claims Clinics dates for 2019 are April 4, June 6, July 11, October 10 and December 5. Put Something Back & Disaster Relief Efforts – The pipeline to pro bono opportunities in the Eleventh Judicial Circuit matches thousands of attorneys with clients in need of an attorney in all areas of civil law including Disaster Relief, Contractor Fraud, Insurance Claims, Small Claims, and Immigration. Over 5,000 private, government, in-house and corporate attorneys are involved and 200+ Law Firm Stakeholders (100% Firms) provide over 20,000 hours of their time annually, at a value of over $4.5 million dollars in free legal services locally. Mobilizes the private bar in record time following disasters and crisis to prevent further devastation across South Florida.